In June of this year, Danny Sitnam, president and CEO of Helijet International Inc., was inducted into Canada’s Aviation Hall of Fame at the CAHF’s 44th annual Gala Dinner. The event was held on the departures level concourse at Vancouver International Airport (YVR). The Vancouver Police Department Pipe Band behind an honour party that included The Honourable Judith Guichon, Lieutenant Governor of British Columbia, escorted the 2017 inductees, Errol Boyd, Robert Deluce, Rogers Smith and Sitnam into the dinner. In his remarks to the audience, Danny had little to say about himself and much to say about the people that have been there with him – and for him – on this journey. In a voice tinged with emotion, he spoke of his parents, brother, business partners and employees at Helijet, and his wife and children. Ten days after the dinner, we sat in Danny’s office and he was still mulling over the evening. “It hasn’t hit me yet, but it will. I think about the inductees and what they’ve done, the stories I heard that evening and the people I met.” Danny Sitnam speaks softly and while he laughs easily, there is intensity within him. You can see it in his eyes, always alive and alert. On the wall of his office is a poster-sized photo of the Aérospatiale Gazelle, the acorn from which Helijet International sprouted. The young Danny Sitnam trained as a machinist but got the flying bug after his first ride in a helicopter. A week after completing his training, he found himself ferrying that same helicopter north to the Yukon. Jump ahead a few years, he was back in North Vancouver and owned that Gazelle with a couple of partners. Where many others would have given up and gone to work for someone else, the partners came up with an even bolder plan. It was something even riskier and took even more money, but they saw it as a better business opportunity. They were going to start a scheduled helicopter service between Vancouver and Victoria. Thinking back on examples of operators who had tried scheduled helicopter services around the world, Sitnam chuckles at what a potential investor would have seen. “They all failed,” he said. “New York Airways, Chicago Airways, LA Airways, all the helicopter start-ups that tried to do urban, city-centre operations. They all failed for one reason or another and we wanted to start this business in Vancouver?” There was also the matter of competing with the established seaplane operators. The kinder bankers at least wished him “good luck” before showing him the door. It was during the startup phase that Sitnam learned the value of human capital, making investments that cost little in terms of dollars and cents, but can pay huge dividends in the future. John Munro, then a member of fledgling Helijet’s board of directors, encouraged Sitnam to meet with Ian Harris of Air BC, which at that time operated Twin Otters on the Vancouver-Victoria route. But fortune smiled, if only briefly, on the team. Sitnam knew a Vancouver-area business that had a Bell 412 coming back from an overseas lease and he was able to secure it. So, in November 1986, Helijet launched its passenger service with that one 412 offering working the Vancouver-Victoria route. The result? There was but one paying passenger on the first flight. “It was four months later and we couldn’t pay our bills. I couldn’t make the lease payments on the aircraft and things got a little strained,” Sitnam says. The bills eventually got paid, and in one of those fortuitous strokes of timing, Sikorsky entered the picture in the person of Jack Donohue. At the 2017 HAI Heli Expo, Sikorsky recognized Helijet for 30 years of safe, scheduled airline and charter operations with its fleet of S-76 helicopters. From its very humble beginnings, the company has grown to 160 full-time employees and the fleet has expanded from its original pair of S-76 helicopters to a more diverse setup of several smaller helicopters and two fixed-wing corporate jet aircraft. Scheduled service now includes a Vancouver-Nanaimo route, with more than 300 weekly flights on the Victoria-Vancouver route. And since 1998, Helijet has provided air ambulance service to BC Ambulance from bases in Vancouver and Prince Rupert. Over those 19 years, they have more than 25,000 flight hours with more than 50,000 patients, flying IFR 24/7 in some of the most challenging terrain in the world. Over the same period, Helijet has established itself on the north coast of B.C., by providing service to many of the world-famous fishing lodges and resorts in Haida Gaia on B.C.’s Central Coast. The lodges are isolated in remote locations. The natural beauty of the region is unmatched, but it is a very different environment that operating in the two-pilot, IFR routes of southern B.C.’s controlled air space. Helijet operates a year-round base at Sandspit Airport, along with mission-specific helicopters and flight crew to serve a wide range of businesses. The fishing lodge business starts up in late spring and runs through to early September, which makes it a good fit for the company, as the passenger load on the Vancouver-Victoria routes tends to drop over the summer. So, has there been any direct conflict with seaplane operators on the scheduled routes over the years? As much as anything, Helijet attracted what Sitnam calls “a new fan base” from the region. It’s mainly business travellers who understand the concept of time being money and not being willing to spend time travelling by ferry or airport-to-airport. Downtown to downtown becomes very attractive. 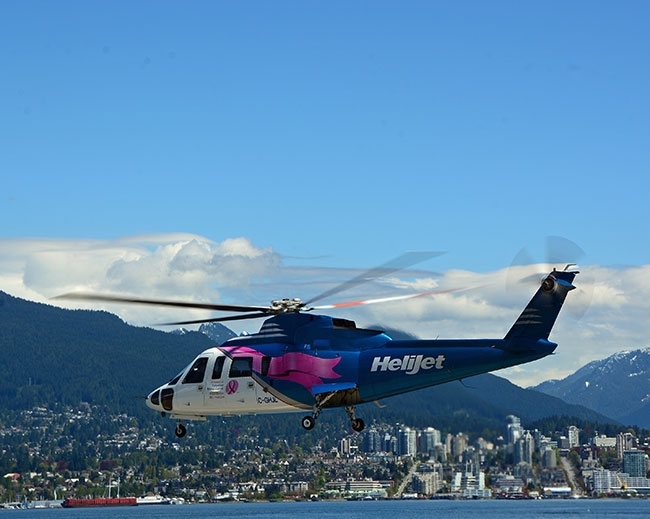 While Helijet’s corporate offices and hangar are on the south side of YVR, the “downtown” terminals in Vancouver, Victoria and Nanaimo are the domain of Pacific Heliport Services, a subsidiary of Helijet. The current heliport in downtown Vancouver was built by Transport Canada (TC) in 1986 for a number of corporate uses as well as Helijet. Ironically, after many years of lobbying TC for the facility, by the time it opened for business, many of the companies that had been operating their own dedicated rotary assets were getting out of the aviation business. By 1988, Helijet was the dominant user of the facility. “We wanted to expand the facilities, but the management didn’t want to, so we bought them out,” Sitnam says. “It’s our people, servicing our own aircraft. 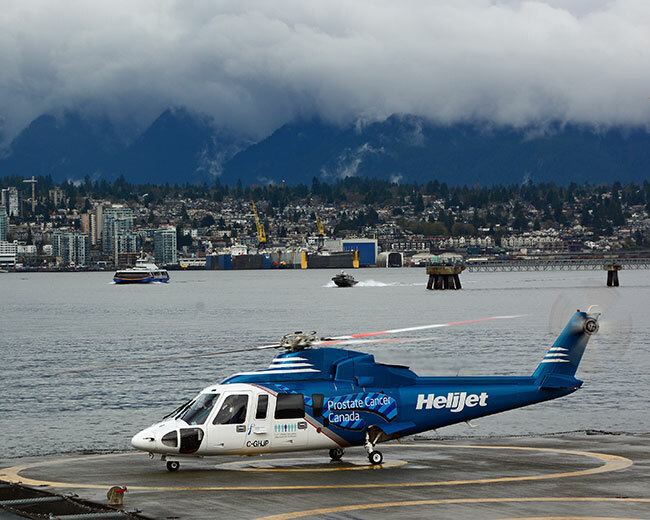 It was academic and it seems to work.” The Vancouver heliport exists in a very desirable neighbourhood, adjacent to the SeaBus terminal and Vancouver’s Trade and Convention Centre. Two years ago, Helijet received the BCAC’s Environmental Award in Aviation in recognition of “environmental initiative, program or accomplishment in one of more areas of protection, rejuvenation, conservation and awareness.” Specifically, the award recognized Helijet for deliberately flying approach and departure routes in Victoria and Vancouver that minimized the noise impact on local residents. Taking circuitous routes meant flying higher, more fuel burn and adding a few more minutes to the routes, but more importantly, the neighbours were happy. 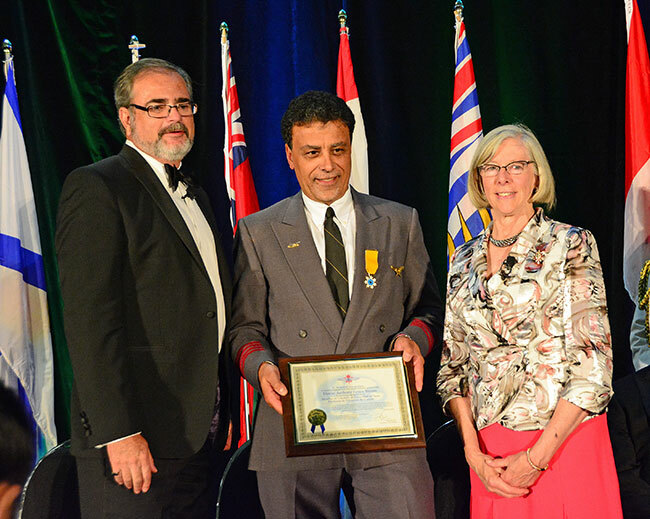 In 2016 at the BC Aviation Councils Silver Wing Awards dinner, Sitnam received the BCAC Lifetime Achievement Award. He also announced that Helijet was establishing an annual $3,500 bursary to enable mid-career helicopter pilots or AMEs to complete further training or certification to further their careers. In the community at large, Helijet has an equally long history of providing sponsorship or partnering with charities. Then there’s Helijet’s role in making sure that Santa gets to visit children in area hospitals when his reindeer are grounded. It’s a new initiative that has piqued the interest of Power To Be, a group with offices in Vancouver and Victoria that works with people who are disabled and can’t enjoy the outdoors. So, what’s in the future for Helijet? “When I look at opportunities for growth, I don’t see that many,” Sitnam says. He has had inquiries from around the world about introducing the Helijet brand, but it’s a tough business to grow out. “Like everything in the airline business, it’s a tough place to make money, whatever you’re flying.” The problem is, as he explained, is that these people want you to put the money in to develop the business. At his point, he says they’re not interested in taking on that risk. What does the future hold for Sitnam? Danny and his family spent January and February in Africa, visiting his brother, who is the director of World Vision International in Africa. You can hear the impact this visit had on him when he speaks, just like that first Bell 412 so many years ago. The visit has also got him thinking again. Stay tuned . . . this story is far from over.